Week One: Fresh grapes and freshly picked rosemary. A nice simple Focaccia recipe from here. Verdict: Why did I ever wait so long to make this. Just make sure you start it when you are not starving already. Week Two: Autumn obviously brings out the bread maker in me. Because The Scout, Miss B and Mr J weren't going to be home for Easter, I decided to do some Easter baking a week early. From Chelsea Winter's book, Scrumptious, I made Chelsea Bunny Easter Scrolls. Lightly spiced, and with a chocolaty (I used quite a bit less that what the recipe said too) fruity filling, these were simple if somewhat time consuming (while waiting for dough to rise) bun to make. Verdict: I didn't glaze them as we are still trying to not add too much extra sugar to our food, however this did not affect the taste at all. They were a big hit, and I would definitely make them again. Week Three: Chocolate was in order after a week of work stresses . This recipe for Chocolate Custard Cake was in the April edition of delicious magazine. It features in Valli Little's new book My Kind of Food. A very easy dessert to make. Lots of very similar recipes available on the internet. Verdict: It looks rich and decadently sweet, but it isn't, which was a nice surprise. Not a hit with Mr J, who doesn't like anything custard (we told him it was a mousse) but the rest of us enjoyed it. Week Four: Feijoa season means buckets of the fruit given to us by our neighbours. While we all enjoy them raw, it is nice to try different ways of using them. This recipe for Feijoa and Custard Crumble Tart was actually one that fortuitously popped up on my Facebook page . Verdict: Not really a difficult recipe to make, we all enjoyed it warm for afternoon tea, including Mr J who didn't realise it had a custard filling. Due to lack of interest in the Cook the Books Link up, I will not be continuing it, however Cook the Books posts will still carry on as usual for at least the rest of the year. Thank you to everyone who linked up in out first Sew, Stitch, Snap, Share. Linda and I were quite overwhelmed at the response. Apologies to everyone who had trouble linking up, Inlinkz have said the problem is now fixed, so fingers crossed you are all able to link up easily this time. Again not a lot of sewing for me. Auckland Libraries staff have finally been given the details of our work restructure package, resulting in all staff having to reapply for jobs, which thankfully is now done. Now we are just waiting to hear what job we get and which library we will be working at, so it is quite a stressful time at present. Needless to say that has taken up a wee bit of quality sewing time. Some good news though, is that I have booked a trip to visit my sister in Australia in June. Of course a trip needs new accessories, so I made a quick and easy little travel folio, just big enough to hold my passport, printed tickets, insurance documents, boarding pass and a pen. Its girly and a little frivolous, and totally different in colour to anything that would be in my bag, so should be easy to locate in my luggage now. I used a Tilda floral fabric for the outer and a co-ordinating text fabric for the inside, vertical quilting to hold those layers together then a simple pocket was bound and stitched to the interior. Bound with a Victoria Findlay Wolfe fabric and tied with a gold toned ribbon. Approximate measurements are 8" x 10". Now for a travel related question, am I allowed to do hand sewing while flying? Please comment on a couple of the other Sew,Stitch, Snap, Share links - its fun to receive comments from new people, and we are trying to encourage people to read blogs and keep blogging too. Thanks for joining us again, I can't wait to see what you have all been creating. The rainbow round has been added, now it is up to planning and cutting for the next round. I think I am going to have to find a bigger fence for photos now. Tomatoes from my Dad's garden, my plants had finished fruiting, so these make it seem like summer is lingering. The last of my summer flowers - cosmos and zinnia, just enough for a little posy. Meeka - she is lucky she's cute, even my family aren't meant to sit on this pillow. Lucy - my stray, who still won't come inside, but is certainly looking well fed and knows where the best sunny spots are on a cool autumnal morning. Hoping you are all enjoying lovely autumnal or spring days too, wherever you are. 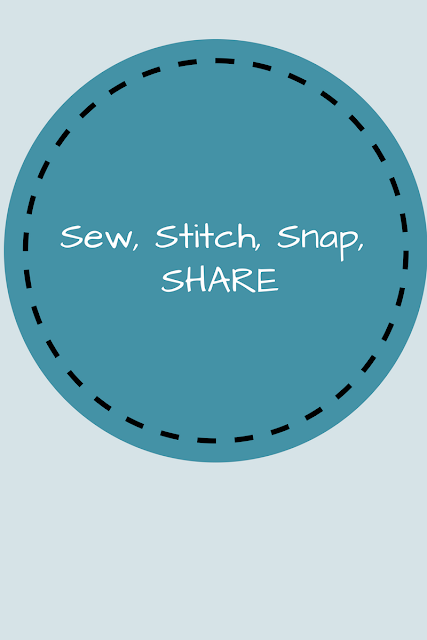 Welcome to our first Sew, Stitch, Snap, SHARE link up. Work has been very busy lately, which though good for the bank account, does cut into the sewing time, Any way here's a little run down of what I been stitching and sewing lately. Remember those little paper pieced flower blocks I had made for my medallion quilt, but decided they were to light for it. I didn't want to waste them, so I have turned them into a pouch for a flower loving friend. I have been making more blocks for my medallion quilt - they are certainly bright, the next round will will use more of the black fabric I think, and hopefully balance it out a little. I have lots of ideas for it, just how to implement some of them is the challenge. A work in progress shot of my Bird Dance project, I am officially over halfway now having completed 17 of them. And on a non sewing related matter, we have a new family member. Her name is still being debated, she is about a year old and into everything, needless to say, I have decided the sewing room is out of bounds to her. Please link up what you have been stitching and sewing this so far this month, and visit some of the other bloggers who have linked too. Linda and I have decided to share the commenting on linked blog posts, so as long as you aren't a no-reply blogger you will receive a comment from either one of us. Thanks for joining us, we are both looking forward to seeing what everyone has been sewing. Loving // What a few months, some hard work, sun and rain can achieve. Remember that garden here and here, well now that summer is well and truly over, I finally remembered to take a photo of it looking all lush and verdant, just not very colourful. Hopefully next year the climber will have covered all the mesh, and my lime tree will have fruited. Eating // Homemade Easter scrolls. Details will be in April's Cook the Books post. Drinking // Peppermint Tea in the evenings. Feeling // Slightly less tense after my completing my beginner's yoga classes. Looking forward to being able to attend daytime sessions on days I am not working now. Making // Another bird, this takes my completed total to 17. My sister has finished all her birds and pieced them together, now she is onto the borders. Thinking // That I should probably buy a few Easter eggs. PS: See you here on Wednesday for our first Sew, Stitch,Snap,Share link up. A trip into the city with Miss B to see The Body Laid Bare exhibition at the Auckland Art Gallery, turned into a lovely afternoon with both of us enjoying the most perfect autumn day, and finding all sorts of interesting things to photograph in Albert Park, Princes street's Merchant's Houses and amazing street art. This book from Floret Flower Farm is making me want to dig up my front lawn and grow all the flowers. I know I will have to plant some Iceland Poppies and am trying to work out where I can grow Sweet Peas for next spring. Lots of yummy homegrown organic grapes from a friend, meant I could finally try making a grape focaccia bread - I'll post about it in April's Cook the Books. Linda from Koka Quilts and I have decided that we need a regular link up to share WIPS and finishes. 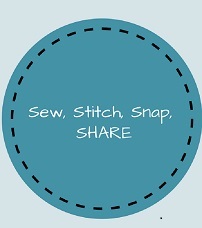 So we have created Sew, Stitch, Snap Share - basically sew and/or stitch each week, snap a photo or three and share it to our link which we will co-host on the second and fourth Wednesday of every month. You can write as much or as little about your project as you like. We both differ in our quilting styles however we both love writing and reading blogs, and don't want them to disappear for the quicker more instant options of showing photos off via Instagram. Sometimes you want the little details about a project not just a hashtag. With regards to my quilts, I love colour, bold prints and EPP, My "make one day" list is never decreasing. One day I want to make a quilt featuring all my Anna Maria Horner fabrics and another one using all Denyse Schmidt fabrics. I enjoy hand quilting and am currently dabbling in felt applique and embroidery. Linda is an amazing quilter, she loves scrappy and colour, and puts them together in a fabulously modern yet vintage way, She is amazingly productive in her quilting output, unlike me!! Check out her blog if you haven't already. We hope that you will take the time to join this link up, share your work, visit some new blogs and make some new blog friends. See you on April 12 for our first one! !